If you thought that the campaign for the Pebble E-Paper Watch would show signs of slowing after it broke Kickstarter records and pushed past $5 million in pledges, you’d be wrong — for it has now topped $10 million in pledges and has sold out of all available watches. For any Kickstarter project it’s an impressive feat to sell out of all of the available products, but Pebble’s campaign didn’t just offer a limited number of bundles, it provided 11 different ways to back the project, ranging from a meagre $1 to simply show support for the idea, to a $10,000 pledge that would secure 100 Pebbles in any color. Just wanted to let everyone know that our current plan is to limit the total number of Kickstarter rewards to around 85,000 Pebbles. As soon as the total exceeds that, all rewards will change to being ‘sold out’. Right now you have claimed 75,000 watches, that leaves only 10,000 more before Pebble is sold out! Not content with hitting $1 million of funding in just over one day, Pebble broke the record for funding on Kickstarter with a whole month to go. The slick e-paper smartwatch that connects to iPhone or Android passed $3.3 million to become the most popular project ever on the site — soliciting pledges from just over 23,000 backers. 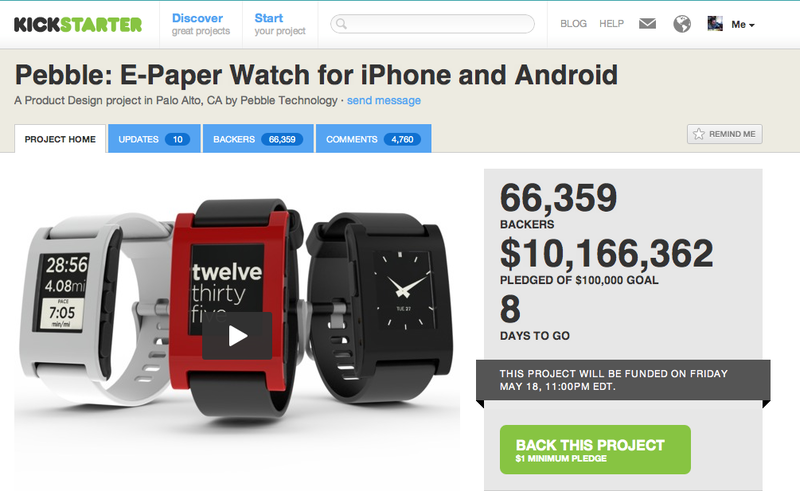 Now with 66,355 backers and $10,166,358 in pledges, the Pebble still has over 8 days until funding closes, but Kickstarter has said that it will be funded on May 18. Once funded, the first batch of watches are expected to ship in September, with its creators adding Bluetooth 4.0 support and an exclusive partnership with RunKeeper, providing a way for owners to view their in-activity fitness stats, start/stop their RunKeeper app and more, directly from their wrist.